Members, to log in to your account please click on the icon above. 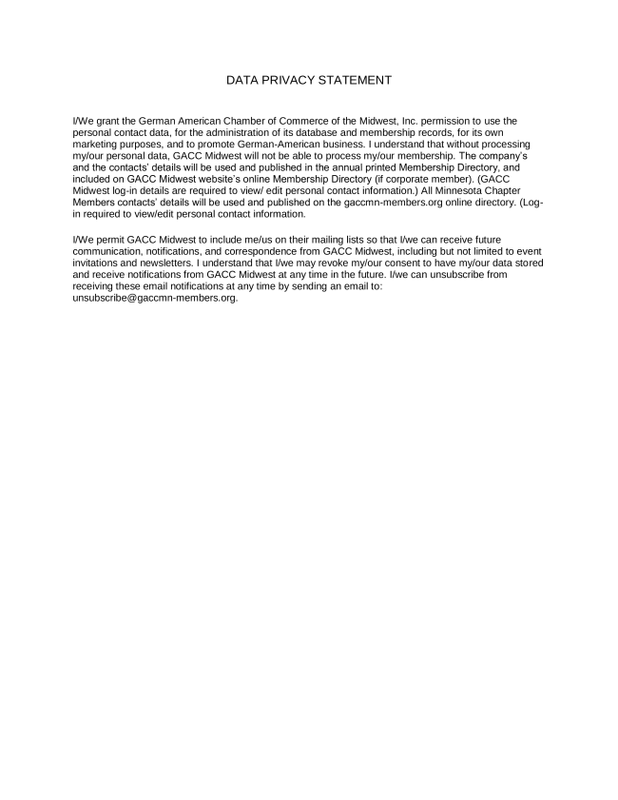 Welcome to the Minnesota Chapter of the German American Chamber of Commerce of the Midwest! Here you can find all the pertinent information about our Minnesota Chapter, including upcoming events and partner organizations. If you are a member, you can access the Minnesota Directory by logging in with your email and password and clicking on the "Members Only Content" tab. There you will also have access to forums, and we invite you to start your own in your chosen field or topic! You can also easily renew your membership online. New membership applications can also be processed by clicking on the "Join Us" tab. Once your payment is received, you will also have access to the members only content, and will receive your welcome packet in the mail, along with your personal Username and Password to access the GACC Midwest online directory (over 800 companies listed). Together, we can make a difference for the businesses in our area. whether you are a new or existing business, this site was created for you, our Minnesota members and potential members, to assist you in expanding your reach and growth.